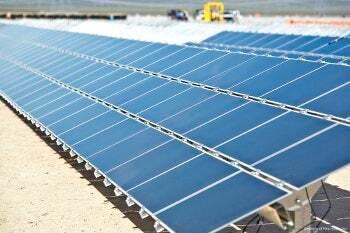 First Solar has announced that the Agua Caliente solar project, currently being constructed in Yuma County Arizona, has hit the 250MW milestone. The photovoltaic power plant, which is connected to the electrical grid, will have a generating capacity of 290MW AC on completion. Jim Tyler, First Solar Engineering, Procurement and Construction Group development engineering vice president, said the company has set a new benchmark for the industry with Agua Caliente project. "The Agua Caliente project exemplifies how utility-grade solar PV power can be rapidly deployed in a phased approach and seamlessly integrated into the electrical grid," Tyler added. Tyler noted that Agua Caliente incorporates the knowledge gained by the firm over the years in designing, building and operating utility-scale solar projects. First Solar has designed the project and will operate and maintain it for owners NRG Energy and MidAmerican Solar. Energy generated at the plant will be bought by Pacific Gas and Electric Company under a 25-year power purchase agreement. The company said the power project incorporates its latest advances in system layout and design, integrated work-flow engineering and optimised balance-of-system components. The facility, which uses advanced thin-film photovoltaic modules, is expected to employ a daily average of 400 to 450 workers during the construction period. Construction of the power project is likely to be completed in 2014. US Department of Energy’s Loan Programs Office has provided a loan guarantee for the Agua Caliente project. Image: The 290MW Agua Caliente solar power project is expected to be completed in 2014. Photo: courtesy of First Solar.